There is a new challenge for those who like to draw conclusions from the philosophy of band names or even deduce the musical direction from them. Flying cakes? How can something like that sound good? Sweet? Foamy? Flaky? If the saxophonist Nils Wrasse, pianist Benjamin Geyer, bassist Thomas Kolarczyk and drummer Philip Dornbusch go to the starting line under the logo "Flying Cakes” as number 77 of the "Jazz Thing Next Generation", then it is less about food intake in lofty heights, but instead musical impressions from very different sites in the world. Band founder Benjamin Geyer discovered the lettering on a wall during an adventurous journey through India, on which an unknown person had sprayed. For some inexplicable reason, he decided that this was the perfect logo for the project that he and his three friends were currently planning. 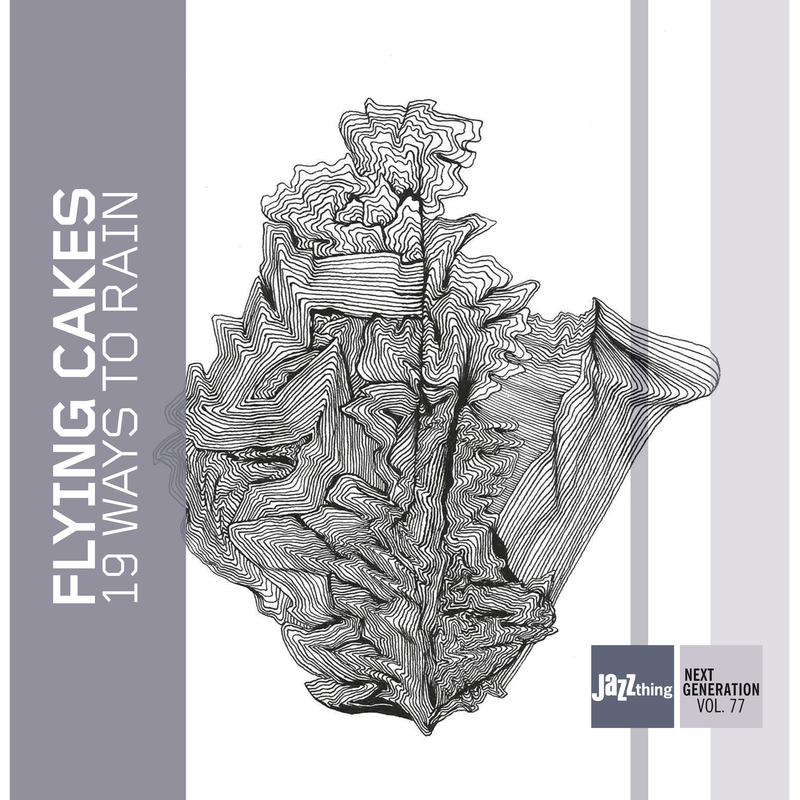 No sooner said than done: Much of Flying Cakes seems familiar, but it is still refreshingly different. Although the four draw on the familiar patterns of jazz, they repeatedly embark on unprecedented paths by processing musical traits of various genres in their compositions. Geyer, Wrasse, Kolarczyk and Dornbusch bring together the perceptions of each individual and transform them skillfully into tones, rhythms, sequences, sound surfaces and solos. If you follow the Flying Cakes, you will automatically embark on an audible journey around the world: a trip full of euphoria, pain, resistance and beauty. “19 Ways To Rain”: Even before the first chords sound, the title song unfolds its complexity. Whether this means 19 different types of rain or 19 different ways to rain? “Questions are good when answers can remain open-ended,” Stefan Weigand wrote in the liner notes. Each of the eleven pieces was created over a period of four years. Sometimes the idea came up in the rapturous ambiance of a long-distance ride from the Black Forest to Berlin (“Lunatico”), and sometimes it was the peace of mind with which a bird on the ledge in front of the window killed time (“Bird”). If there is something that Flying Cakes do not need, then this is fixed patterns or even a constant approach in the search for ideas. Special moments, which are hard to describe, come to the fore for this. One impulse follows the other, and Benjamin Geyer, Nils Wrasse, Thomas Kolarczyk and Philip Dornbusch come together and begin to function as an organism. They manage to sound free and yet extremely precise. In doing so, they simply leave compressions to themselves and consequently slowly create a feeling of distance and proximity. Catchy melodies interact with 7/4 and 11/4 bars as in “Lunatico”. Nothing happens as it should. Surprises remain the highest asset of this ensemble, which is exemplified in “Gentlemen Don't Run”. As a result, the band with the somewhat strange name actually works perfectly without really wanting to be perfect: rebellious, unpredictable, with the desire to inspire, to attract, to drive each other forward. Freedom arises when you release things, let them get out of control. The music of the Flying Cakes doesn't need any answers. The questions that Geyer, Wrasse, Kolarczyk and Dornbusch ask with their music are already breathtaking enough. "With this unpredictable and very attractive album, Flying Cakes will definitely appeal to a young generation of jazz lovers."